«My favourite cinema is the Coronet, Notting Hill – Kiki Dee says. – While I lived in London, I often attended it with Jenny, my friend from Paddington. I much prefer the smaller, independent art house style of cinema to the bigger multiplex. In addition to the Coronet’s accessibility – like the Gate, just nearby – it seems it’s one of those cinemas that hasn’t altered much over the years. And there’s always something showing that you’ll like. It’s particularly good that they’ve retained the screen curtain which adds such a sense of occasion and drama to movie-going; and the auditorium’s good atmosphere offers a nice, intimate feel which in some ways makes it seem like your own private screening room. My film tastes are quite eclectic – I like many foreign films from, say, La Vie en Rose to Amelie, but also things like Hot Fuzz, and with some of the more period pieces, I quite enjoy studying the interiors and furnishings in the scenes. I can’t stand violence, however, and on seeing No Country For Old Men recently, I must have spent over half the film with my eyes and ears closed. 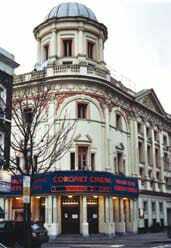 It seems we’re forever paying out for things in life and so one of the best things, since turning 60, is that I can take advantage of discounts and at the Coronet I can now get in for just £4!